गे लुसाक ने वायु एवं अन्य कई गैसें एकत्र की तथा उनके भौतिक एवं रासायनिक गुणों की खोज की। उसने बायल के नियम तथा चार्ल्स के नियम की प्रायोगिक पुष्टि भी की। उसने गैसों के घनत्व एवं उनकी संरचना का सम्बन्ध भी बताया. 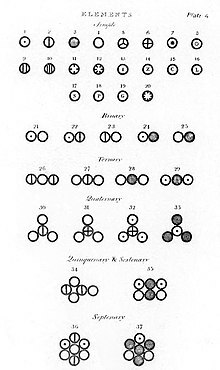 John Dalton publishes New System of Chemical Philosophy, which contains first modern scientific description of the atomic theory, and clear description of the law of multiple proportions. Jöns Jakob Berzelius publishes Lärboki Kemien in which he proposes modern chemical symbols and notation, and of the concept of relative atomic weight. Friedrich Wöhler and Justus von Liebig perform the first confirmed discovery and explanation of isomers, earlier named by Berzelius. Working with cyanic acid and fulminic acid, they correctly deduce that isomerism was caused by differing arrangements of atoms within a molecular structure. William Prout classifies biomolecules into their modern groupings: carbohydrates, proteins and lipids. Friedrich Wöhler synthesizes urea, thereby establishing that organic compounds could be produced from inorganic starting materials, disproving the theory of vitalism. Friedrich Wöhler and Justus von Liebig discover and explain functional groups and radicals in relation to organic chemistry. Germain Hess proposes Hess's Law, an early statement of the Law of conservation of energy, which establishes that energy changes in a chemical process depend only on the states of the starting and product materials and not on the specific pathway taken between the two states. Hermann Kolbe obtains acetic acid from completely inorganic sources, further disproving vitalism. Louis Pasteur discovers that the racemic form of tartaric acid is a mixture of the levorotatory and dextrotatory forms, thus clarifying the nature of optical rotation and advancing the field of stereochemistry. August Beer proposes Beer's law, which explains the relationship between the composition of a mixture and the amount of light it will absorb. Based partly on earlier work by Pierre Bouguer and Johann Heinrich Lambert, it establishes the analytical technique known as spectrophotometry. 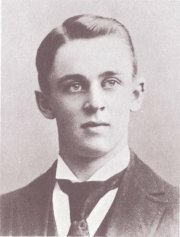 Benjamin Silliman, Jr. pioneers methods of petroleum cracking, which makes the entire modern petrochemical industry possible. William Henry Perkin synthesizes Perkin's mauve, the first synthetic dye. Created as an accidental byproduct of an attempt to create quinine from coal tar. This discovery is the foundation of the dye synthesis industry, one of the earliest successful chemical industries. Friedrich August Kekulé von Stradonitz proposes that carbon is tetravalent, or forms exactly four chemical bonds. Gustav Kirchhoff and Robert Bunsen lay the foundations of spectroscopy as a means of chemical analysis, which lead them to the discovery of caesium and rubidium. Other workers soon used the same technique to discover indium, thalium, and helium. Stanislao Cannizzaro, resurrecting Avogadro's ideas regarding diatomic molecules, compiles a table of atomic weights and presents it at the 1860 Karlsruhe Congress, ending decades of conflicting atomic weights and molecular formulas, and leading to Mendeleev's discovery of the periodic law. Alexander Parkes exhibits Parkesine, one of the earliest synthetic polymers, at the International Exhibition in London. This discovery formed the foundation of the modern plastics industry. Alexandre-Émile Béguyer de Chancourtois publishes the telluric helix, an early, three-dimensional version of the Periodic Table of the Elements. John Newlands proposes the law of octaves, a precursor to the Periodic Law. Cato Maximilian Guldberg and Peter Waage, building on Claude Louis Berthollet’s ideas, proposed the Law of Mass Action. Johann Josef Loschmidt determines exact number of molecules in a mole, later named Avogadro's Number. Friedrich August Kekulé von Stradonitz, based partially on the work of Loschmidt and others, establishes structure of benzene as a six carbon ring with alternating single and double bonds. Adolf von Baeyer begins work on indigo dye, a milestone in modern industrial organic chemistry which revolutionizes the dye industry. Dmitri Mendeleev publishes the first modern periodic table, with the 66 known elements organized by atomic weights. The strength of his table was its ability to accurately predict the properties of as-yet unknown elements. Jacobus Henricus van 't Hoff and Joseph Achille Le Bel, working independently, develop a model of chemical bonding that explains the chirality experiments of Pasteur and provides a physical cause for optical activity in chiral compounds. Josiah Willard Gibbs publishes On the Equilibrium of Heterogeneous Substances, a compilation of his work on thermodynamics and physical chemistry which lays out the concept of free energy to explain the physical basis of chemical equilibria. Ludwig Boltzmann establishes statistical derivations of many important physical and chemical concepts, including entropy, and distributions of molecular velocities in the gas phase. Svante Arrhenius develops ion theory to explain conductivity in electrolytes. Jacobus Henricus van 't Hoff publishes Études de Dynamique chimique, a seminal study on chemical kinetics. Hermann Emil Fischer proposes structure of purine, a key structure in many biomolecules, which he later synthesized in 1898. Also begins work on the chemistry of glucose and related sugars. Henry Louis Le Chatelier develops Le Chatelier's principle, which explains the response of dynamic chemical equilibria to external stresses. Eugene Goldstein names the cathode ray, later discovered to be composed of electrons, and the canal ray, later discovered to be positive hydrogen ions that had been stripped of their electrons in a cathode ray tube. These would later be named protons. Alfred Werner discovers the octahedral structure of cobalt complexes, thus establishing the field of coordination chemistry. William Ramsay discovers the noble gases, which fill a large and unexpected gap in the periodic table and led to models of chemical bonding. J. J. Thomson discovers the electron using the cathode ray tube. Wilhelm Wien demonstrates that canal rays (streams of positive ions) can be deflected by magnetic fields, and that the amount of deflection is proportional to the mass-to-charge ratio. This discovery would lead to the analytical technique known as mass spectrometry. Maria Sklodowska-Curie and Pierre Curie isolate radium and polonium from pitchblende. Ernest Rutherford discovers the source of radioactivity as decaying atoms; coins terms for various types of radiation. ↑ O'Connor, J. J.; Robertson, E. F. (2003). "Roger Bacon". MacTutor. School of Mathematics and Statistics University of St Andrews, Scotland. अभिगमन तिथि 2007-03-12. ↑ "Johann Baptista van Helmont". History of Gas Chemistry. Center for Microscale Gas Chemistry, Creighton University. 2005-09-25. अभिगमन तिथि 2007-02-23. ↑ अ आ "Robert Boyle". Chemical Achievers: The Human Face of Chemical Sciences. Chemical Heritage Foundation. 2005. अभिगमन तिथि 2007-02-22. ↑ Cooper, Alan (1999). "Joseph Black". History of Glasgow University Chemistry Department. University of Glasgow Department of Chemistry. अभिगमन तिथि 2006-02-23. ↑ Partington, J.R. (1989). A Short History of Chemistry. Dover Publications, Inc. आई॰ऍस॰बी॰ऍन॰ 0-486-65977-1. ↑ "Joseph Priestley". Chemical Achievers: The Human Face of Chemical Sciences. Chemical Heritage Foundation. 2005. अभिगमन तिथि 2007-02-22. ↑ "Carl Wilhelm Scheele". History of Gas Chemistry. Center for Microscale Gas Chemistry, Creighton University. 2005-09-11. अभिगमन तिथि 2007-02-23. ↑ अ आ इ Weisstein, Eric W. (1996). "Lavoisier, Antoine (1743-1794)". Eric Weisstein's World of Scientific Biography. Wolfram Research Products. अभिगमन तिथि 2007-02-23. ↑ "Jacques Alexandre César Charles". Centennial of Flight. U.S. Centennial of Flight Commission. 2001. अभिगमन तिथि 2007-02-23. ↑ Burns, Ralph A. (1999). Fundamentals of Chemistry. Prentice Hall. पृ॰ 32. आई॰ऍस॰बी॰ऍन॰ 0023173513. ↑ "Inventor Alessandro Volta Biography". The Great Idea Finder. The Great Idea Finder. 2005. अभिगमन तिथि 2007-02-23. ↑ अ आ "John Dalton". Chemical Achievers: The Human Face of Chemical Sciences. Chemical Heritage Foundation. 2005. अभिगमन तिथि 2007-02-22. ↑ "December 6 Births". Today in Science History. Today in Science History. 2007. अभिगमन तिथि 2007-03-12. ↑ "Jöns Jakob Berzelius". Chemical Achievers: The Human Face of Chemical Sciences. Chemical Heritage Foundation. 2005. अभिगमन तिथि 2007-02-22. ↑ "Michael Faraday". Famous Physicists and Astronomers. अभिगमन तिथि 2007-03-12. ↑ अ आ इ "Justus von Liebig and Friedrich Wöhler". Chemical Achievers: The Human Face of Chemical Sciences. Chemical Heritage Foundation. 2005. अभिगमन तिथि 2007-02-22. ↑ "William Prout". अभिगमन तिथि 2007-03-12. ↑ "Hess, Germain Henri". अभिगमन तिथि 2007-03-12. ↑ "Kolbe, Adolph Wilhelm Hermann". 100 Distinguished European Chemists. European Association for Chemical and Molecular Sciences. 2005. अभिगमन तिथि 2007-03-12. ↑ Weisstein, Eric W. (1996). "Kelvin, Lord William Thomson (1824-1907)". Eric Weisstein's World of Scientific Biography. Wolfram Research Products. अभिगमन तिथि 2007-03-12. ↑ "History of Chirality". Stheno Corporation. 2006. अभिगमन तिथि 2007-03-12. ↑ "Lambert-Beer Law". Sigrist-Photometer AG. 2007-03-07. अभिगमन तिथि 2007-03-12. ↑ "Benjamin Silliman, Jr. (1816-1885)". Picture History. Picture History LLC. 2003. अभिगमन तिथि 2007-03-24. ↑ "William Henry Perkin". Chemical Achievers: The Human Face of Chemical Sciences. Chemical Heritage Foundation. 2005. अभिगमन तिथि 2007-03-24. ↑ अ आ "Archibald Scott Couper and August Kekulé von Stradonitz". Chemical Achievers: The Human Face of Chemical Sciences. Chemical Heritage Foundation. 2005. अभिगमन तिथि 2007-02-22. ↑ O'Connor, J. J.; Robertson, E.F. (2002). "Gustav Robert Kirchhoff". MacTutor. School of Mathematics and Statistics University of St Andrews, Scotland. अभिगमन तिथि 2007-03-24. ↑ "Alexander Parkes (1813 - 1890)". People & Polymers. Plastics Historical Society. अभिगमन तिथि 2007-03-24. ↑ अ आ इ "The Periodic Table". The Third Millennium Online. अभिगमन तिथि 2007-03-24. ↑ अ आ "Julius Lothar Meyer and Dmitri Ivanovich Mendeleev". Chemical Achievers: The Human Face of Chemical Sciences. Chemical Heritage Foundation. 2005. अभिगमन तिथि 2007-02-22. ↑ P. Waage, "Experiments for Determining the Affinity Law", Forhandlinger i Videnskabs-Selskabet i Christiania, (1864) 92. ↑ "Johann Josef Loschmidt". John H. Lienhard. The Engines of Our Ingenuity. NPR. KUHF-FM Houston. 2003. No. 1858. Transcript. Retrieved on 2007-03-24. ↑ "Adolf von Baeyer: The Nobel Prize in Chemistry 1905". Nobel Lectures, Chemistry 1901-1921. Elsevier Publishing Company. 1966. अभिगमन तिथि 2007-02-28. ↑ "Jacobus Henricus van't Hoff". Chemical Achievers: The Human Face of Chemical Sciences. Chemical Heritage Foundation. 2005. अभिगमन तिथि 2007-02-22. ↑ O'Connor, J. J.; Robertson, E.F. (1997). "Josiah Willard Gibbs". MacTutor. School of Mathematics and Statistics University of St Andrews, Scotland. अभिगमन तिथि 2007-03-24. ↑ Weisstein, Eric W. (1996). "Boltzmann, Ludwig (1844-1906)". Eric Weisstein's World of Scientific Biography. Wolfram Research Products. अभिगमन तिथि 2007-03-24. ↑ "Svante August Arrhenius". Chemical Achievers: The Human Face of Chemical Sciences. Chemical Heritage Foundation. 2005. अभिगमन तिथि 2007-02-22. ↑ "Jacobus H. van 't Hoff: The Nobel Prize in Chemistry 1901". Nobel Lectures, Chemistry 1901-1921. Elsevier Publishing Company. 1966. अभिगमन तिथि 2007-02-28. ↑ "Emil Fischer: The Nobel Prize in Chemistry 1902". Nobel Lectures, Chemistry 1901-1921. Elsevier Publishing Company. 1966. अभिगमन तिथि 2007-02-28. ↑ "Henry Louis Le Châtelier". World of Scientific Discovery. Thomson Gale. 2005. अभिगमन तिथि 2007-03-24. ↑ "History of Chemistry". Intensive General Chemistry. Columbia University Department of Chemistry Undergraduate Program. अभिगमन तिथि 2007-03-24. ↑ "Alfred Werner: The Nobel Prize in Chemistry 1913". Nobel Lectures, Chemistry 1901-1921. Elsevier Publishing Company. 1966. अभिगमन तिथि 2007-03-24. ↑ "William Ramsay: The Nobel Prize in Chemistry 1904". Nobel Lectures, Chemistry 1901-1921. Elsevier Publishing Company. 1966. अभिगमन तिथि 2007-03-20. ↑ "Joseph John Thomson". Chemical Achievers: The Human Face of Chemical Sciences. Chemical Heritage Foundation. 2005. अभिगमन तिथि 2007-02-22. ↑ "Alfred Werner: The Nobel Prize in Physics 1911". Nobel Lectures, Physics 1901-1921. Elsevier Publishing Company. 1967. अभिगमन तिथि 2007-03-24. ↑ "Marie Sklodowska Curie". Chemical Achievers: The Human Face of Chemical Sciences. Chemical Heritage Foundation. 2005. अभिगमन तिथि 2007-02-22. ↑ अ आ "Ernest Rutherford: The Nobel Prize in Chemistry 1908". Nobel Lectures, Chemistry 1901-1921. Elsevier Publishing Company. 1966. अभिगमन तिथि 2007-02-28. ↑ "Fritz Haber". Chemical Achievers: The Human Face of Chemical Sciences. Chemical Heritage Foundation. 2005. अभिगमन तिथि 2007-02-22. ↑ "Leo Hendrik Baekeland". Chemical Achievers: The Human Face of Chemical Sciences. Chemical Heritage Foundation. 2005. अभिगमन तिथि 2007-02-22. ↑ "Niels Bohr: The Nobel Prize in Physics 1922". Nobel Lectures, Chemistry 1922-1941. Elsevier Publishing Company. 1966. अभिगमन तिथि 2007-03-25. ↑ "James Chadwick: The Nobel Prize in Physics 1935". Nobel Lectures, Physics 1922-1941. Elsevier Publishing Company. 1965. अभिगमन तिथि 2007-02-28. ↑ "Otto Hahn: The Nobel Prize in Chemistry 1944". Nobel Lectures, Chemistry 1942-1962. Elsevier Publishing Company. 1964. अभिगमन तिथि 2007-04-07. ↑ "The Nobel Prize in Medicine 1962". Nobelprize.org. The Nobel Foundation. अभिगमन तिथि 2007-02-28.